2nd Match: James Anthony & Flex Simmons def. 5th Match: Victor Andrews vs. 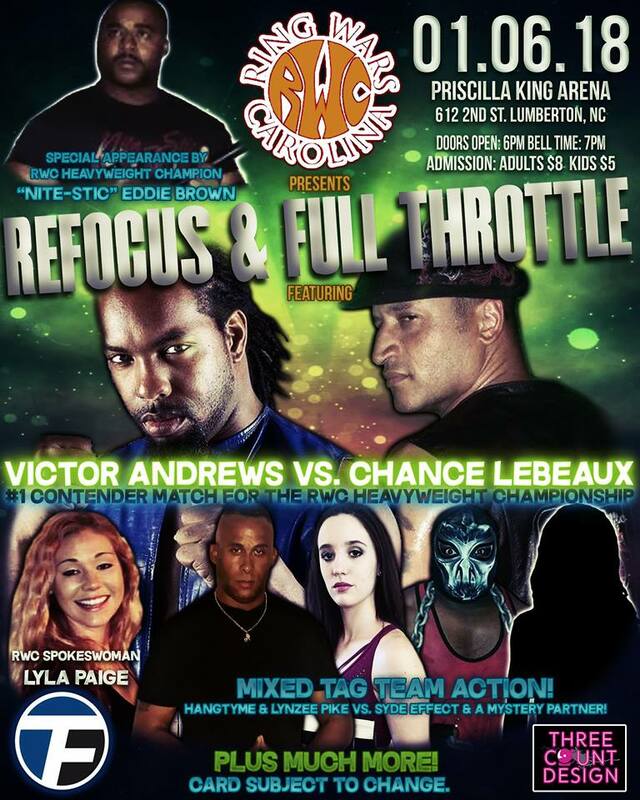 Chance Lebeaux ended in a Double Disqualification. Notes: Drew Thomas returned t give an update on his future in wrestling when James Anthony interrupted his final words. Drew Thomas standing in the middle of the ring with 1 crutch and a large knee brace on, made it clear to Lumberton NC that He was NOT giving up or quiting! When James Anthony turned his back to address the crowd, Drew took off his Knee brace and tossed it over James Anthony's head. When James figured out what it was, he was being chased by a upset, crutch armed Drew Thomas! The crowd went crazy for the RETURN to action by DREW THOMAS! Lynzee Pike walked in to RWC Training Academy approximately 6 months ago with the idea of becoming a female referee for RWC events. She opted to train just like the wrestlers to understand wrestling as a whole and not just as a ref. Good thing she did cause this Award Winning Author was forced to defend herself by one of the biggest monsters in RWC, Syde Effect. Hangtyme rescued the damsel in distress. The match was set but no one knew who Syde Effect would have in his corner. From the dark corners of mystical canopy, Dani Fererra appeared. Although beautiful to the sight she is the most sydistic and evil minded person controlling The monster. 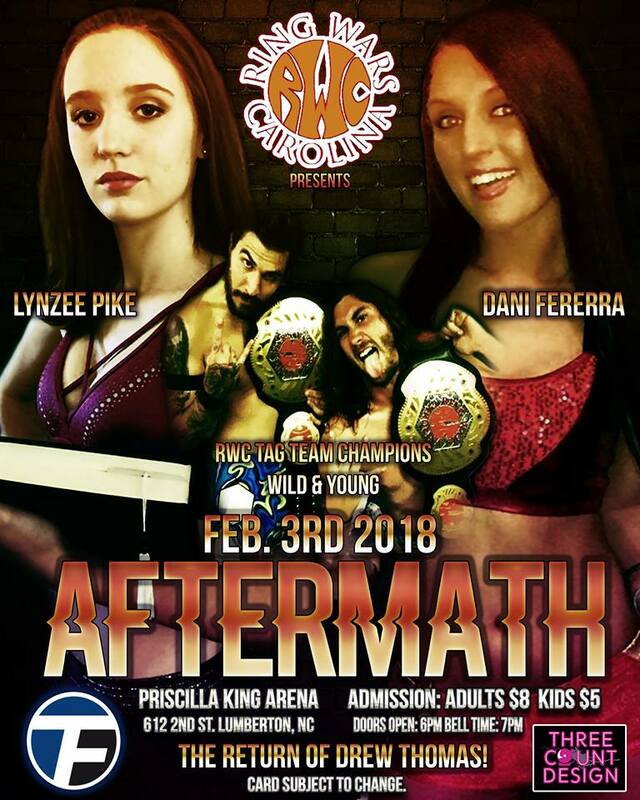 Lynzee Pike starts her next chapter on showing RWC fans that she is no push over and held her on in the ring. She stepped up to the plate and wrote some highlights of a blossoming career ahead of her. The RWC fans are looking to read and see more of the debuting LYNZEE PIKE! Welcome to RWC! Aftermath is going to be exciting! The females get top billed this month. The battled spilled over! Lynzee Pike goes 1 on 1 with Dani Fererra! This will heat up the building by itself! The return of the RWC Tag Team Champions, Wild & Young! It will definently be a party on February 3, 2018 in Lumberton NC!